You are here: Home / Restaurant / Barbecue in St Bart’s! A taste of England with a nod to America’s Deep South. On a hot summer’s night, I’m unwinding in St Bart’s. Not the Caribbean island, but a welcoming cool pub in the heart of London. I’m here to sample the new barbecue soul food menu featuring the finest fresh and sustainably sourced British meat, (as you’d expect, given that we are right by the famous Smithfield meat market), smoked or slow cooked with Kentish apple wood. Kentish apples are in St Bart’s DNA. The pub is part of the Hush Heath Estate, founded in Tudor times, steeped in English history and nestled in the Garden of England. 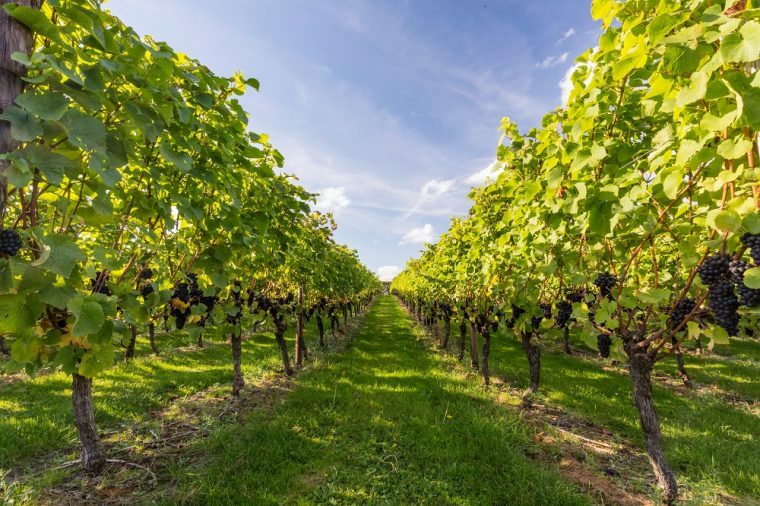 This is where sixteen years ago, hotel and hospitality entrepreneur, Richard Balfour-Lynn planted his first vines and now Pinot Noir, Pinot Meunier and Chardonnay grapes flourish amidst orchards blossoming with Bramleys, Cox Orange Pippin and Egremont Russets. 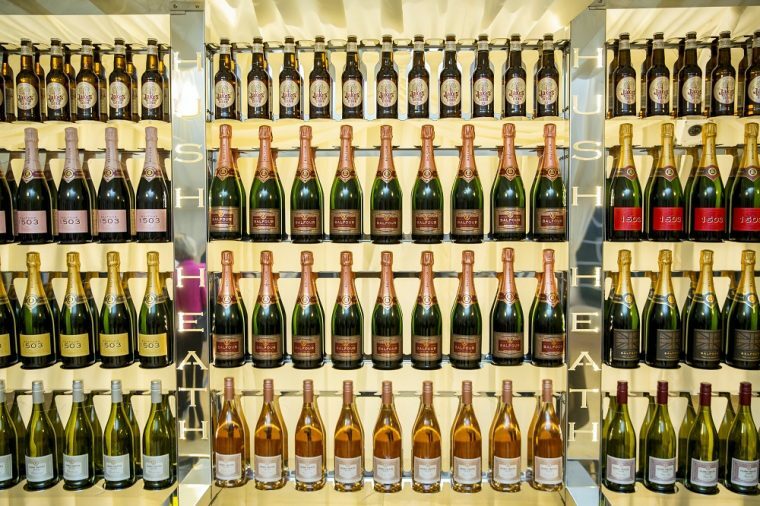 The resulting exclusive pink fizz, Balfour Brut Rosé, along with delicious still wines and delectable ciders can now be enjoyed here at St Bart’s. 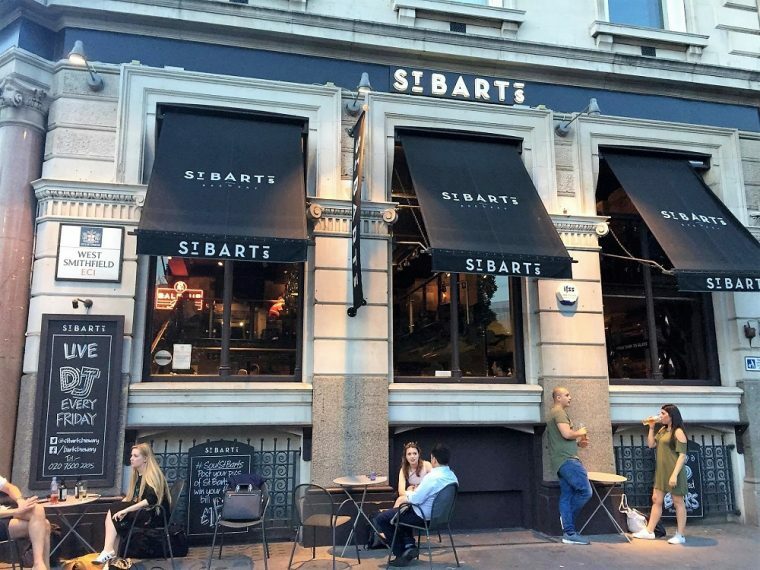 With its tastefully contemporary décor, St Bart’s is spacious and light. It’s a flexible space, great for gatherings of any sort or size, and is a well-established wedding venue. Its evening event programme includes pub quizzes, band-nights and, currently, summer Friday-night DJ sessions. It has the feel of a “local”, with its home-grown wines, ciders and ales but it is these excellent products which, at the same time, make this a destination worth making a detour for. The menu offers small plates of shrimps, whitebait, wings, halloumi; sides with a southern state sweetness and the U.S. inspired flavours continue across sandwiches and salads featuring buttermilk, chipotle, challah bread and sourdough. 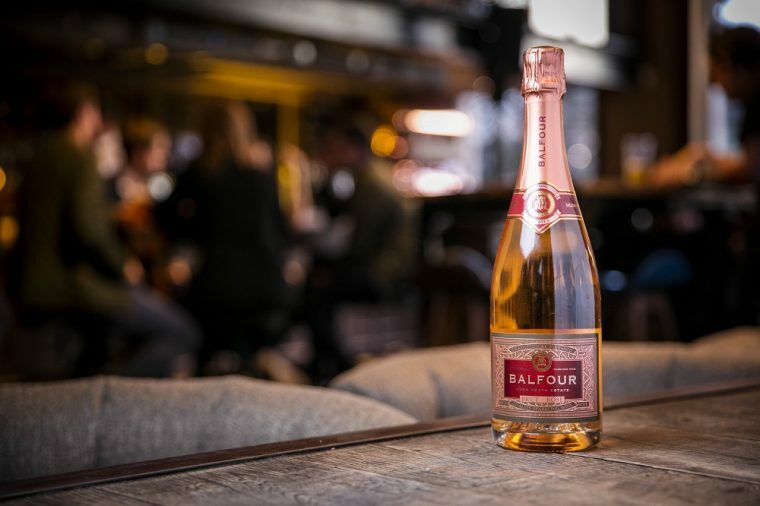 Whilst sampling the multi award-winning Balfour sparkling rose which lived up to its reputation (fabulous! 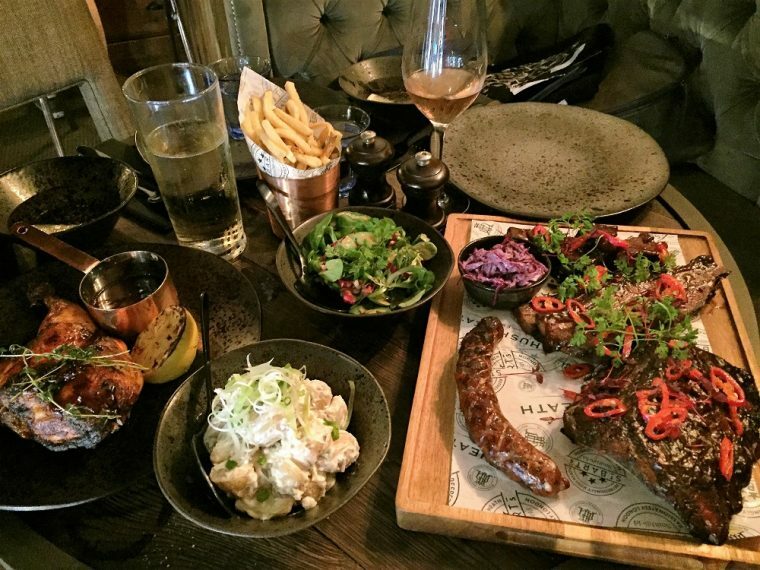 ), we chose to share a selection of meat dishes all cooked using apple tree wood from the Hush Heath Estate. The portions were generous with the Pit Masters Tray (a selection of smoked sausage, slow-cooked brisket, ribs and “burnt ends”, chunks of smoked, sticky brisket) demonstrating head chef, Ginger’s, aim to provide a mouth-watering British barbecue experience. The “Burnt Ends”, new to us but big in Kansas City, were moist and delicious. The sausage was perfectly cooked and full of flavour. A classic slow-roasted half chicken finished with lemon, garlic and thyme was fabulously juicy and the accompanying coleslaw and potato salad were light and fresh and perfect for summer. With our food, I drank rose – Nanette’s English Rose (delicious) whilst my Pub Expert companion tried Jakes Kentish Cider and declared it “Amazing” for its flavour and delicacy. Nannette and Jake are two of Balfour-Lynn’s children and on the intriguing drinks menu you’ll find other family members lending their names to wines, ciders, ales and juices, such is their pride and confidence in the produce of their estate. 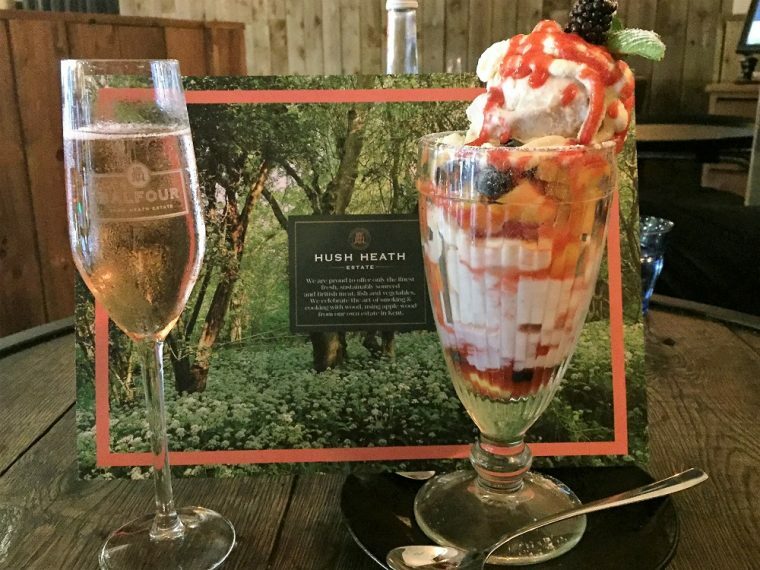 A glass of NV Jake’s Orchard Rose Champagne Cider (a revelation to me) was the perfect accompaniment to the one and only dessert featured on St Bart’s menu, a Knickerbocker Glory. And it was. If like me, you’re a fan of British food festivals and farmers’ markets then a trip to St Bart’s, offering English produce on tap, holds real charm. With a bar team who, with friendly expertise, will shake-up a Kentish Kocktail or a Sangaree (an 18th century precursor of the Spanish sangria – another Great British invention! 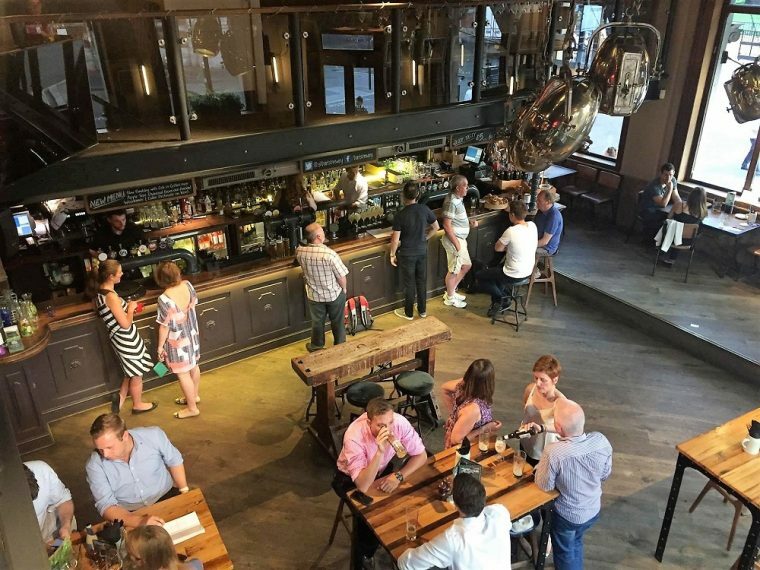 ); a menu that changes to ensure fresh, seasonal British food; a huge range of craft beers, speciality spirits, artisanal ales, as well as international wines alongside the Hush Heath selection you’re guaranteed that there’ll always be something additional to savour. Sounds fab. You’ve just reminded me, there’s a smoke house near here that serves Burnt Ends, so delicious.